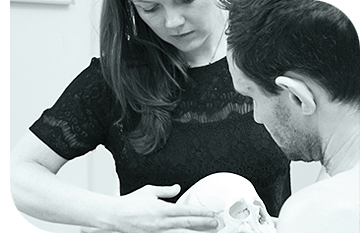 Cranial osteopathy is a refined and subtle type of osteopathic treatment that encourages the release of stresses and tensions throughout the body, including the head. It is a gentle yet extremely effective approach and may be used in a wide range of conditions for people of all ages, from birth to old age. "Cranial Osteopathy" evolved from the observations of Dr Sutherland in 1899 and his teachings to colleagues until his death in the 1950�s. Dr Sutherland originally observed that the 22 bones of the skull interleave in a way designed for movement: they fit together �like gears of a watch�, moving minutely, influencing each other and the tissues underneath (the brain, cerebrospinal fluid and membranes). He considered that every cell and all the fluids of the body express a rhythmic, involuntary motion and that this involuntary motion is of primary importance in each person�s health and vitality. He spent the next thirty years researching the cranial concept and taught it until his death in 1954. It, alongside the traditional osteopathic models, has also led to the development of the current approaches to the osteopathic care of children. This rhythmic involuntary motion is often called the cranial rhythmic impulse or the involuntary mechanism. This impulse� is palpable to osteopaths as a cyclic rhythmic wave of motion present throughout the body. It is not a �movement� like at the knee joint or elbow joint, it seems to be a sense of resilience, yielding or expansion type motion, a rise and fall similar to a tide when felt by osteopaths trained in this approach. This motion seems to take place within the fluid based systems of the body as well as the whole body framework and fascia. As it is a tiny movement, it is most easily felt with only very light touch, some call it �cranio-sacral� as it is slightly easier to feel at the head and at the base of the spine (the sacrum). Where the flow of this wave of fluid is blocked, it is thought that problems may arise. These restrictions are thought to impair the body�s own inherent healing mechanisms Restrictions can be felt by osteopaths to occur in the central nervous system, lymphatic system, sinuses, joints, fascia, soft tissues and organs � craniosacral dysfunction patterns may be found throughout the body. Treatment is directed towards reducing restrictions in the flow of this fluid via the body framework. This is thought to release membranous and articular strains and patterns within the cranial system or within the body framework, help fluid drainage and encourage a more vital expression of the involuntary mechanism.